Master Gardeners are present at several different farmers markets each week, generally spring through fall, where we set up an information table stocked with county-specific gardening leaflets for the public, and basic reference books for ourselves. We answer questions from home gardeners and serve as an informal plant clinic, often referring clients to the Information Desk and SCMG website for more in depth information. We sometimes feature a specific educational display (such as a worm bin, or gopher traps, etc.) that helps pique the curiosity of passers-by and further engage the public. 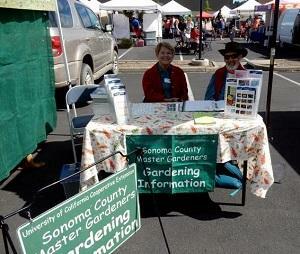 The Master Gardeners also have booth displays with appropriate informational handouts at annual county events such as the Sonoma County Fair, Citrus Fair, Heirloom Expo, and the North Bay Science Fair.